When I’m explaining the Synergistic mindset to people, I’m often struck by the degree to which folks root their understanding in that which they know. Even though just about every aspect of the Synergistic mindset differs one hundred and eighty degrees from what most people regard as “normal” (i.e. aspects of the Analytic mindset). One example came up during a Twitter conversation earlier this week, which I thought might make an interesting case in point. We all love the idea of promotions, don’t we? A reward for a consistent job well-done. Some folks live for their next promotion. But in the synergistic mindset, promotions are a vice, not a virtue. A sign of some significant dysfunctions. 1. violent or tumultuous motion; agitation; noisy disturbance. 2. political or social disturbance or upheaval; sedition; insurrection. Promotions are, by definition, extrinsic rewards. As such, there is much research to show that they demotivate the recipient. (See e.g. Dan Pink’s book “Drive”). Promotions perpetuate the idea of hierarchy. Job positions, and the idea of “moving up the ladder” reinforce the notion of hierarchy within organisations. Hierarchy is a hallmark of Analytic-minded organisations, and is so ubiquitous as to be rarely noticed, let alone questioned. Yet, hierarchy is a core dysfunction of the Analytic organisation, enshrining as it does the notion of separating things into parts (and sub-parts, and so on) in the mistaken belief that optimising the parts will lead to an optimal whole (as Ackoff showed us, the reverse is in fact the case). Hierarchies also inevitably follow the Iron Law of Oligarchy. Promotions increase alienation within the workplace. Many highly competent, highly qualified individuals are often passed-over for promotion for a number of reasons. More often than not, promotion decisions are made within and by the existing Core Group, and for reasons little to do with competency, productivity, etc. but along much more nepotistic lines. 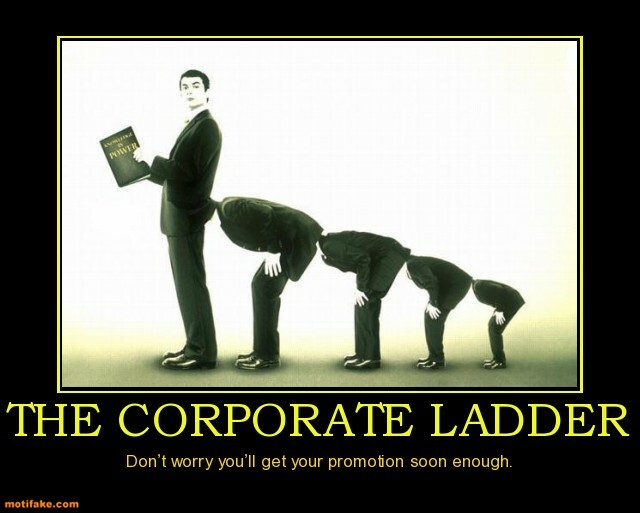 Promotions contribute to the Peter Principle. That is, they help contribute to having people occupying positions in which they are ineffective at best, and often, incompetent. Promotions run contrary to the principles of Autonomy, Mastery and Purpose. If other folks are deciding your future, this reduces autonomy. If you’re striving for mastery of a skill or skill-set, then who but you is best placed to decide where you are on that journey? And if you have found an engaging purpose, what chance the purpose will remain as valid in a different position – often in a different business unit or job role? Promotions signify a lack of imagination, misunderstanding of human motivation. Progressive organisations believe that recognising folks and their efforts leads to better morale, engagement and thus productivity. Research shows this can be so. But why not recognise folks directly? Why conflate the whole process with the idea of promotion? Are organisations so lacking in imagination that they cannot find means to provide people with effective and useful feedback, and mark significant points in their progression towards e.g. Autonomy, Mastery and Purpose? So, does anyone have a good word to say for promotions, aside from the fact that you might like one, soon? (Wry smile). Set your locus of control within you…who needs promotion and approval? Great article. Can I offer another issue promotion brings? The kill creativity. If you want to get promoted you need to follow the rules of the person who has the power to promote you. This discourages ‘thinking different’ and sets the org on a path of stasis. Thanks for joining the conversation. And for the addition to the list of dysfunctions caused by promotions and the hierarchies implicit therein. Thought provoking article as always Bob! One thing not mentioned here is pay/salary. Promotions are often linked to pay. Pay still seems to be the most prickly subject in orgs. How would pay be structured in a synergistic or chaordic org? Does everyone earn the same amount? Is pay linked to the performance of the org? Does someone with 1 yr experience earn the same as some one with 30 yr experience? Thanks for joining this conversation. Yes, promotions and pay are most often tightly coupled. Semco has one approach to pay, and in Familiar we insisted that each person decide their own pay rate (salary, or day rate) and terms of engagement. Who but the person in question is best placed to understand their own value, and needs? Bob, you mention that promotions, as extrinsic rewards demotivate people. There are however, albeit limited, situations where rewards do help motivation (even Dan Pink mentions that) – for example when the task is repetitive, not challenging and just needs to be done. This perhaps looks somewhat similar to how Analytic organisations see most tasks and hence thinking promotions are the right tool to improve. Thanks for reminding me to flag to readers that I’m mostly posting about knowledge-work organisations and knowledge work. Your proviso is quite right, of course. In one of my trips to Japan, I learned how several Deming Prize companies invest in their people through the commitment of lifetime employment. They have a pyramidal organization structure, just as we do for our titled positions. But because of their investment in people, their actual staffing exceeds the confines of the pyramid in the middle and upper management levels. This might seem excess baggage to the western mind. But in Japan these people are valued treasure to the organization. While our titled organization is occupied with ad hoc committees and other discursive meetings, their titled organization is working on ways to improve the system. The other resources are busy visiting customers, training younger employees, participating in the ad hoc meetings and otherwise providing the social memory needed to sustain the company. We don’t have this experienced work force because of our up or out pressures. — Scherkenbach, William (2011-07-01). Second Edition of The Deming Route to Quality and Productivity (Kindle Locations 1987-1989).